I recently had the opportunity to go with some of the students to visit people in the hospital across the street from the school. Every weekend, the students go out to the people to serve. Some of them help the elderly, some of them visit the prison, some of them work with children, some visit the sick. 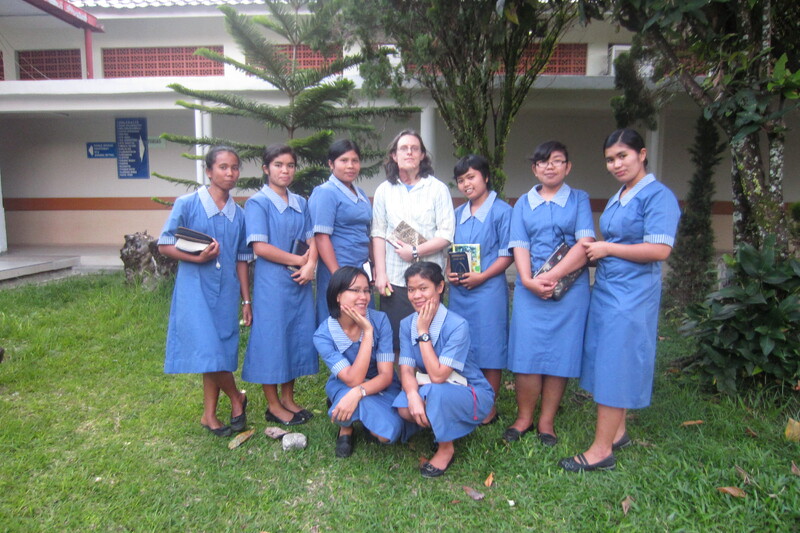 These young women have committed their lives to faith and service in Christ, and they come to the deaconess school for training in Biblical studies, community organizing, Church history, health, sociology, English language and theology, and more, though it is serving the people that gives them joy. The hospital is laid out in separate buildings with covered walkways as corridors between the buildings. Some rooms have one patient, others have 2 or as many as 6 beds in the larger rooms. Every Saturday the 3rd year deaconess students come to the hospital to sing hymns, read a Bible passage, and visit patients. They do this by first going to a section and singing from their choir book. Then a Bible passage is read in Batak and Bahasa Indonesia. After this, they visit the rooms. I sang and prayed with them, even though I could not understand the words. As is customary here, we greeted everyone in the room with a handshake, each time touching the right hand to the heart. Sometimes we stopped in a room for prayer and a hymn. In a room with a mother and new baby, I was asked to pray; my prayer in English was then translated into Batak. In all, we saw new babies (one very premature), people with diabetes, the elderly, young children, a young man with a broken arm, a young man with malaria, and others whose illnesses I don’t know. It is early in my time in Indonesia, so I am just becoming acquainted with the food, culture, the students themselves and their way of life at the school. Nevertheless, their way of life as joy in serving others is very apparent. They give of themselves, showing the love of God, and attend to the needs of the people. For the deaconess students here, serving is a way of life. I, too, experienced the love of God as I looked into the eyes of those in the hospital and their families. I cannot yet speak their language, but the language of love centered in Christ isn’t English, Bahasa Indonesia, Batak, or German. A heart full of grace and a soul generated by love. This, I believe, is a central part to the diaconal identity. It is such a blessing to be living with sisters in Christ.